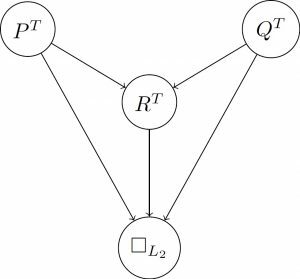 This post is primarily directed at students in the AI class at University Erlangen to explain the Davis-Putnam (Logemann-Loveland) Algorithm for SAT solving and implication graphs for clause learning. in conjunctive normal form (CNF). Unit Propagation: If contains a unit, that is a clause with just one literal, then we extend our current assignment by that literal; meaning if , then we let and if we let . Then we simplify (more on that later) with our new assignment and repeat. When contains no units anymore, we check whether is now empty; if so, we are done and we return our current assignment . If not, we check whether now contains an empty clause; if so, we return . Splitting: So now is not empty, contains no empty clauses and contains no units. We’re left with guessing an assignment, so we pick one propositional variable on which our assignment is currently undefined, let , simplify with our new assignment and recurse. If returns an assignment, that means we guessed currently and we return that. If it returns , we guessed wrong and instead let , simplify and recurse with that. By simplify I mean: If in our current assignment we have (or respectively), then we delete from all clauses that contain the literal (respectively ). In the remaining clauses, we eliminate the literal (respectively ). Now why does this work? Let’s start with unit propagation: If contains a unit literal , then the formula corresponding to our clause set looks like this: and obviously, for this formula to be satisfied, we need to set . Conversely, if we have the unit literal , then the formula looks like this: and we obviously need to set to satisfy . Now for simplification: If we assign , then any clause that contains the literal will be satisfied by , since clauses are interpreted as the disjunction of its literals. Consequently, we can ignore these clauses from now on. The remaining clauses however will still need to be satisfied, and if we have , then we know that the literal will be false anyway, which means we can ignore it in any disjunction (i.e. clause) containing it. We let and simplify, yielding . We have a unit clause, so we do unit propagation by letting and simplifying. Unfortunately, that yields containing the empty clause, so we return . The former branch failed, so we let and simplify, yielding . is empty, so we return the current assignment . If at any point a clause becomes the unit clause , then for each literal with we add an edge from to (where is the negation of the literal ). The intuition behind this being, that when we do unit propagation, we’re using the fact the formula is logically equivalent to . The new edge is (sort-of) supposed to capture this implication. If at any point a clause becomes empty, then for each literal we add an edge from to . Here we are using the fact, that the formula is logically equivalent to . We let and simplify, yielding . is now a unit clause. 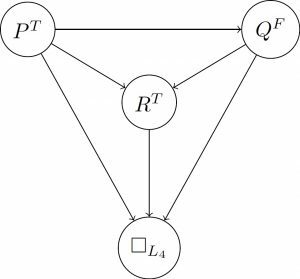 Apart from , the original also contained the literals and , so we add to our graph two new edges to , one from and one from (remember: from the negations of the original literals! ).Now we do unit propagation , resulting in becoming the empty clause. The original contained the literals , and , so we add edges from , and to and return . Since the former branch failed, we add our new clause and simplify, yielding . Now became a unit clause, so we add an edge from to , do unit propagation by letting and simplify, yielding . Now became a unit, so we need to add edges from and to .We do unit propagation again and becomes the empty clause, adding the edges from , and to . Finally, we return . This time, we can immediately see that the bad choice was . We can learn from this, by adding the new clause , which of course is a unit and thus immediately becomes part of our assignment. 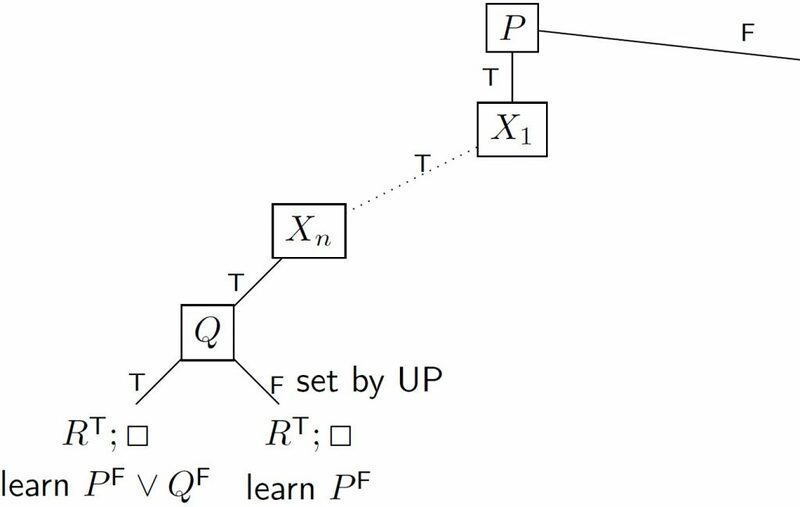 So, how exactly do we get from implication graphs to clauses? That’s simple: starting from the contradiction we arrived at, we take every ancestor of the -node with no incoming edges – i.e. the roots. 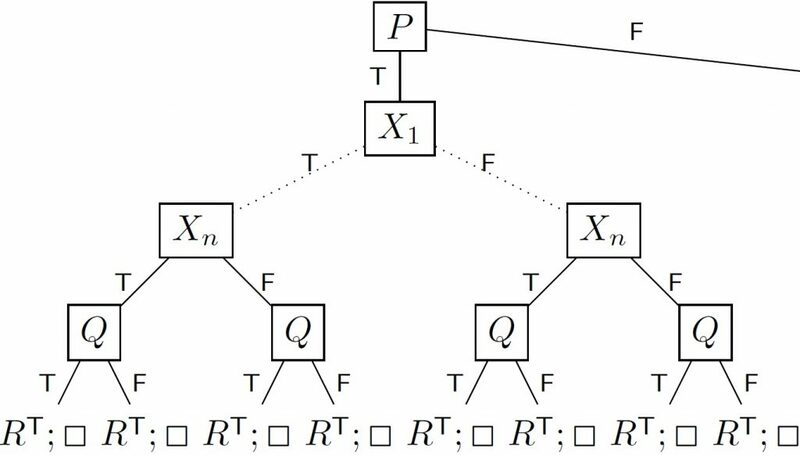 Those are the literals that were chosen during a split-step in the algorithm, and the other ancestors are all implied (via unit propagation) necessarily by those choices. These choices (i.e. their conjunction) lead to the problem, so we take their negation and add them as a new clause: In the first example graph, the roots were the node and , so we added the new clause . In the second graph, the only root was , so we added the clause . Two failures are now enough to conclude, that setting was already a mistake and we can immediately backtrack to the beginning.